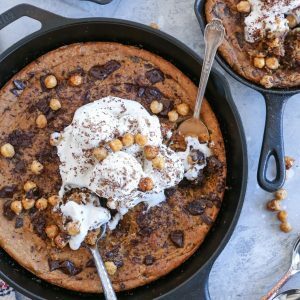 Crispy on the outside, moist and gooey on the inside chocolate chip skillet cookie made with chickpeas, pure maple syrup, and almond butter for a healthier dessert. This super easy-to-prepare gluten-free and vegan dessert recipe will become a staple in your household! This post is sponsored by Saffron Road. Welcome to your newest epic mind meld. If you were wondering whether or not you can have it all in life, the answer is yes, yes you can. 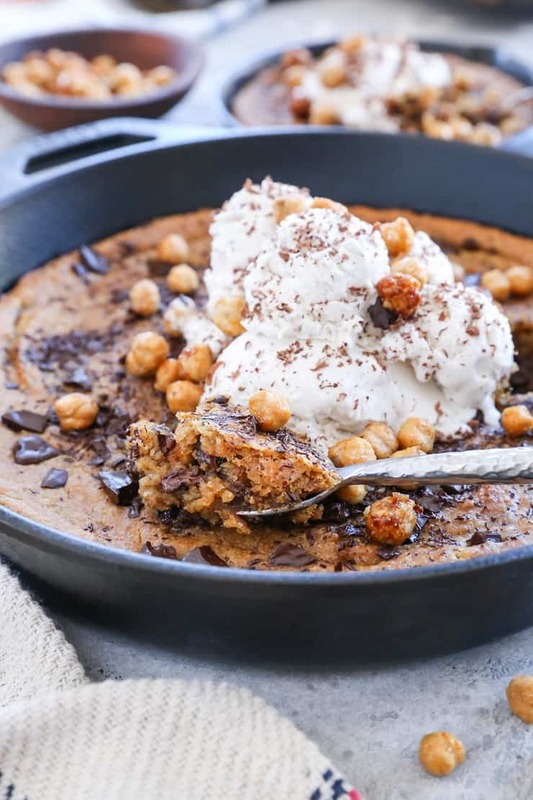 This nutty, sweet, gooey skillet cookie is made with deceptively clean ingredients for an incredibly indulgent dessert that happens to be on the healthier end of the spectrum. 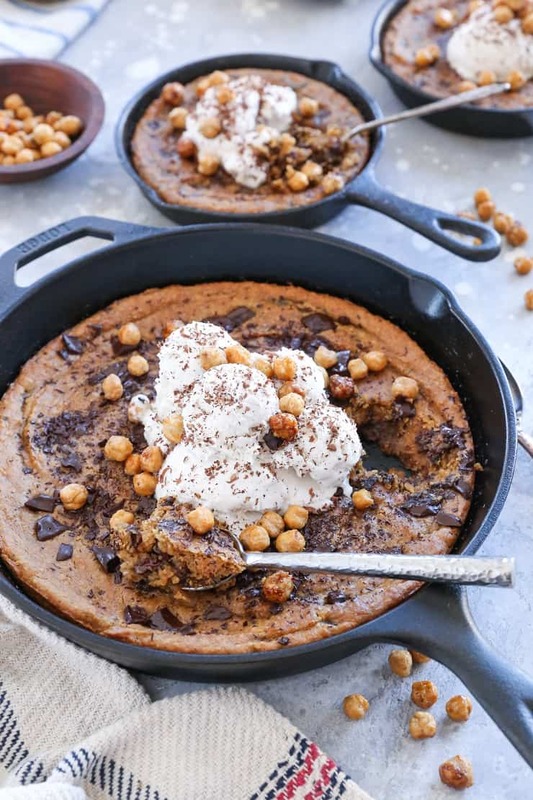 Made with chickpeas, almond butter (or nut butter of choice), and pure maple syrup, this skillet cookie is gluten-free and dairy-free. 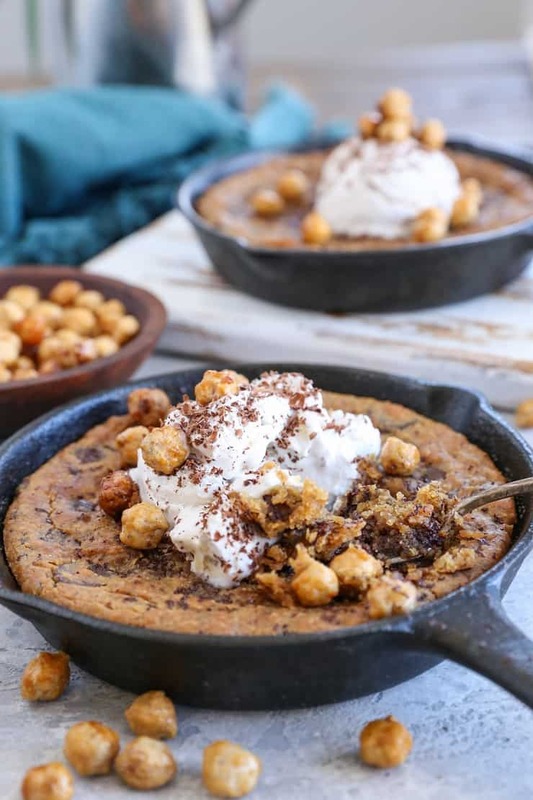 Sure, this chocolate chip skillet cookie is still full of sugar (pure maple syrup), but relative to a classic fully-leaded skillet cookie, it’s a cleaner, more thoughtful treat for forging healthier habits. Skillet cookie topping options? I thought you’d never ask. I topped this situation with dairy-free ice cream and Saffron Road’s new Salted Caramel Crunchy Chickpeas. The Salted Caramel Crunchy Chickpeas are perfectly designed for your snacking enjoyment. They’re salty, sweet, crunchy, and easy to bring along to work, on road trips, you name it…and also marvelous for topping skillet cookies as it turns out. Saffron Road’s crunchy chickpeas also come in three other flavors: Honey Roasted, Dark Chocolate Chai, and Dark Chocolate. Along with their new line of roasted chickpea treats, Saffron Road recently revamped their branding and added a new tagline, “Journey to Better.” For me, the Journey to Better means continuously staying open so as to learn, grow, and enjoy life with an open mind. When you stay true to yourself and have real conversations with yourself, you stay on the path to self-improvement, which in turn benefits your life and the lives of those closest to you. You have a few options when it comes to baking this beauty. I tested the recipe using two small 5-inch cast iron skillets, and also tested it in a 9-inch cast iron skillet. You can also use an 8” x 8” cake pan if you don’t have a skillet option. 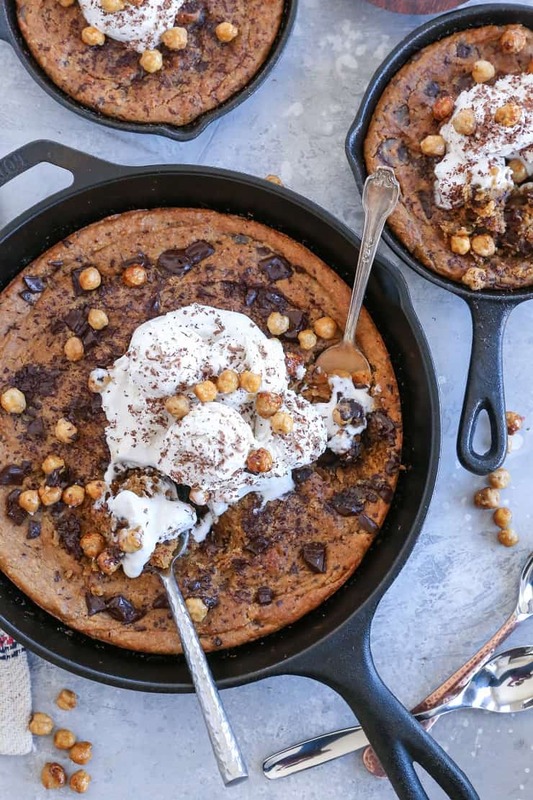 One of the best parts about this skillet cookie, other than the fact that it’s amazingly melt-in-your-mouth nutty, chocolatey, moist and delicious, is the fact that it’s prepared in a blender. Simply add everything but the chocolate chips to your blender, blend on high until it’s nice and creamy, then add in your chocolate chips. Bake it off, and you’re good to go! Just be sure to serve the dessert hot with ice cream and crunchy chickpeas. Saffron Road is having a sweepstakes, where you can enter for a chance to win a free trip. To enter, click HERE for a chance to win. I have yet to try beans in a dessert and this is the one I want to try first! 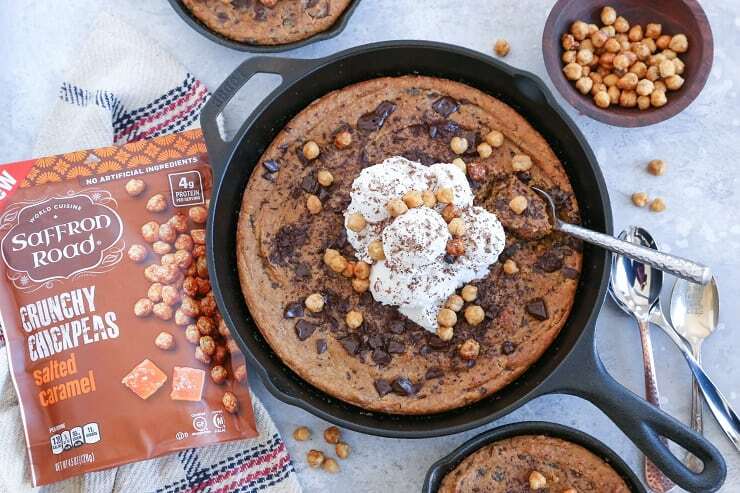 I love skillet cookies and this combination just sounds incredible! That’s great that it’s made in a blender so it’s even easier! I will make this next time the grand kids come to visit…won’t that be fun! Yeeeeees, they will love it!